In a recent post I dealt with three Pontypool topics, namely The Robin Hood pub, the Pontymoile park gates and the Donkey steps. Jeff Oates said that he had discovered from the 1911 Census that his grandfather had kept the pub. It now seems that another email correspondent, Harold Clarke, has discovered that some of his relatives also kept the same pub. He has also sent a photograph of some of them. Added to this is some surprising information I have received from Harold just today, namely that there was a Benjamin and Ann Gregory who had an adopted daughter with an address given as Robin Hood, Cwnnatddu, Cwmfrwdoer. I have no knowledge of this particular Gregory but visitors who have read my earlier posts will have read of my Uncle, Percy Gregory who ran the shoe shop in Hanbury Road not far from the Robin Hood. 1. “My wife’s grandparents, Albert and Mary Powell, kept the Robin Hood pub in late 1920s into the thirties and brought up nine children at the pub. One of these children was Annie who married Stanly White. They had four children one, Wilfred, born at the pub. At about two years of age Wilfred had his own small glass and would go around for the men to put some beer in it. The beer was served straight from barrels set on stone shelves to the rear of the bar. The pub consisted of four rooms, two up two down, with one room downstairs being used as the bar. The water for the pub came from a spring on the other side of the railway. This was a spur line which ran past the bottom of the alley. It meant the water had to be carried some two to three hundred yards, no mean task bearing in mind all the children and what would be needed for the pub. The pub was owned by the Rumney Breweries. In the 1970s we tried to purchase it from them. It was then still standing but they would not sell it. Approx twenty years later they offered to sell but by this time it was not salvageable. In early 1950s it was kept by the Allens, and my wife still visited with her parents on a summer evening. The path leading up to the pub was known as the alley. 2. “I was hoping to have come up with a photo of the actual pub. At the moment I cannot do that but I believe I have located the brewery records at Glamorgan Record Office. I am afraid I will have to wait for a response from these as you can only contact them via email or snail mail. A Little more information for Jeff and maybe, if you decide to put it on the blog, someone from the Allen family might pick up on it as when they were there most people would have had cameras, also the Curtis family, that is why I have given the names. 3. “The wife got me working overtime on this and I just came across something which might be just coincidence but you refer to connections with the Gregory family. In the 1891 census there is a Benjamin Gregory born 1835 in Somerset. His wife Ann, buried at St Cadocs, had an adopted daughter giving her address as Robin Hood Cwnnantddu Cwmfrewddoer. Well, that’s the story of the Robin Hood public house so far. If anyone has any further information or photographs to add I’m sure Jeff and Harold would be interested and so would I. This entry was posted on March 27, 2011 at 8:27 pm and is filed under important events, information, Places around Pontypool, Pontypool people. You can follow any responses to this entry through the RSS 2.0 feed. You can leave a response, or trackback from your own site. 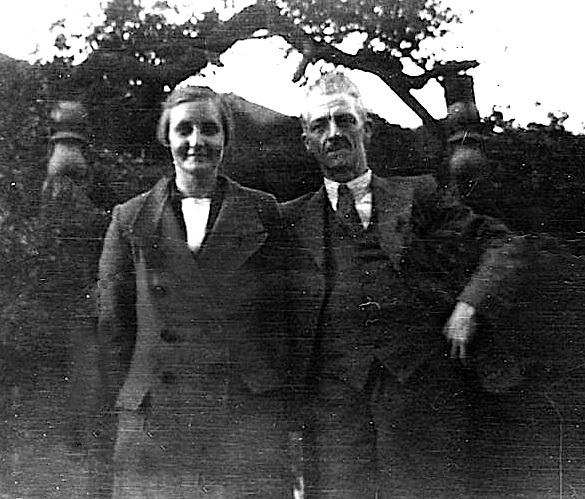 William Curtis and his wife Gwen ran a pub in Gilfach Goch and helped to raise my grandmother (also Gwenllian’Williams’) I understand they returned to Pontypool. A family story passed down to me is that my maternal great-grand-father at one time in his life ran the Robin Hood pub. i liked the picture of annie powell apparantly my grandmother whom i never knew was a florence annie powell married a authur bullock at st cadocs in 1918 myself i live in newport my mother was a florence ivy bullock born in 1924 at edward street . sorry harold thnanks for letting me know it was a guess on my part. all the best from john. Regards the Robin Hood Inn, my parents were the last owners of the pub until it as closed at some point in the 1970’s. ( I will look into the actual date). I have a few photo’s of the pub between the 1950’s-1970’s which I will dig out for you. Please feel free to get in touch if you want any more information. I was brought up around the area and would love to see thesephotos if you have them please. I would love to see any photos of the Robin Hood, as my grandmother was a Richards, and was certainly living there with her 9 brothers and sisters in 1911( Census). Father was Oliver ( colliery worker) and mother Elizabeth( formerley Mathews) Elizabeth was the daughter of Sarah Gregory. Kathleen, it’s great to hear there are more photos of the Robin. So far I only have the one. As with Steve Parry our ancestor John Curtis kept the pub from about 1891 to 1906. I’ve recently been told the last pint was pulled October 1968. Like Steve i would love to see the other photos. Reading the older posts, a little more info, Emanuel Treherne was the landlord in 1924. This is a puzzle to me as I can’t find a connection to the Gregory family. Ben Gregory c1870- 1891, 1891-1906 his niece Mary Jane Curtis, 1906- c1920 Elizabeth Richards ( niece ), c1930-1939 Mary Ethel Powell ( daughter of Mary Jane ). Also in 1896 the Robin is listed as the HQ of Jabez Gregory ( Bens brother ). Jabez is the owner of Pentwyn Slope Colliery and later the brickworks. Emanuel Treherne was my great grandfather. He moved to the Cwmffrwdoer area about 1887-8 from Coleford and in 1891 is recorded in the Register of Electors as living at Cwmnantddu The 1900 entry has him residing in Gipseys (sic) Lane (later records point to this being at Hollybush Cottage). In the entry for 1922 he is at the Robin Hood Inn and he is resident there until at least 1927. My grandmother Violet Richards lived at the Robin Hood pub during the 1911 census. My great grandmother Elizabeth ( formerly Mathews) ran the pub ,as Oliver her husband was a colliery worker. My g grandmother Mary Jane was sister to Elizabeth. She was married to John Curtis and lived at the Robin 1891 – 1906 before moving to the Plasycoed Inn. Their mother was Sarah Gregory, sister to Ben & Jabez. Thanks for that information Brian. I have been researching the Richards family.My grandmother Violet often told me how hard the life was at the Robin for her mother,having 10 children to look after,unfortunately I haven’t got any photos of Elizabeth or Oliver Richards.As a child we took walks from Pontnewynydd to the Robin along the Gypsy Lane. I remember as a boy visiting the Robin Hood with my mother, Lena Irene Powell, who was one of 6 sisters to Anne Powell; there were also 2 brothers, Cliff and Wilf. Lena was born at the pub and worked there as a girl, making sandwiches for visitors. I lived, with my mother, (Lena Stride nee Powell) in Snatchwood and remember my grandmother (Mary Ethal Powell) living with us. She died in 1946 at the age of 54. She was preceded in death by my grandfather, Albert Powell, who died in 1938 at the age of 54. I have a copy of the death certificate for my grandfather and his residence is listed as the Robin Hood at the time of his death. Can I assume that Harold Clarke is married to my cousin, Cynthia? I am little confused about some of the dates in the early 1900. My greatgrandfather emanual treherne who was a miner and we have his miners lamp,lived in the robin hood and my grandmother flossie last of their seven children who was born in the robin hood on june 14 1904 ,we also have her birth certificate with date and place of birth and also a family picture of emanual treherne his wife and six of their children taken by the photographer jones and co park road pontypool possibly taken in the grounds of the robin hood as we have the two kitchen chairs that they are sat on in the picture. John Taylor was the landlord of the Plasycoed in 1901 and he died there in 1906. The Curtis family may have moved there prior to his death and took over on it. Oliver Richards is at the Robin in 1911 and then Emmanuel again in 1924. I’ll have to check the Licensing records at Ebbw Vale, something I’ve meant to do for ten years. It would be great to see your photo of Emmanuel and family at the Robin. I have seen a photo of two Treherne brothers playing Quoits and the one looked very much like a work colleague, Jeff Treherne, also a descendant. You’ve set me a puzzle now about John Curtis between 1901 & 1906. When and if I find out I’ll let you know. John Curtis was landlord of the Robin through out the 1890’s and his wife’s uncle Ben Gregory for a few decades before that. John’s brother William was married to Gwenllian Tomlin sister to Martha your Gwen’s mother. I think that’s probably the Robin connection. William Curtis was one of 15 children including my great grandfather John. They were the children of William & Ann. They migrated from Cromhall Gloucs following the birth of William Jnr in 1853. The rest were born at Ty Llocha Cwmnantduu Pontypool. The parents died in 1882 & 86 and are buried at Ebenezer. Only William Jnr was childless, my own G Grandfather John having 12, all which survived to adulthood. So at one time there were a high number of descendants in the area but not any longer. When researching the family I couldn’t understand why William appeared in the 1891 as living in Gilfach Goch but now it makes sense. By 1901 he’s back in Pontypool living at 23 Union St Abersychan & 1911 the Miners Arms Union St possibly the same. Two of his brothers, George & Tom are also publicans in the Abersychan area at the same time and John of course at the Robin followed by the Plasycoed Inn. You can see my family tree at Ancestry.com under the owner Terry Jones. I looked on Amazon and read the first few pages last week but it said it was out of print at the moment. I’ll keep an eye on it. .Anyone heard of the name Rachael, she was known as” RachaelThe Robin”. She was the adopted child of the Gregorys. She was my Great Grandmother Later ran the pub with her Husband He died in the Llanhileth (Please excuse spelling)Colliery Disaster. I know of one child born to them named Martha, my Grandmother who married a Richard Higgs. They had two children Mary and Rachael? I’ve heard of Rachel, she was the daughter of Thomas Hughes & Ann Jenkins of Blaenavon. Mary Rachel was adopted by Ben & Ann Gregory, sister to her mother. They lived at the Robin until it was taken over by my G Grandfather John Curtis. Rachel married Griffith Griffiths in 1884 and had a number of children. Griffiths was kllied in a mining accident at Llanhilleth. She later married Charles Powell and lived at Blaenavon. Later in life she moved to Swansea where she died in 1954. Hope this helps. Many thanks Brian, a lot of these names ring a bell. The daughter of Rachel named Martha lived in Cwmfridor and married a Richard Higgs. I remember when little many visits to Hereford to visit various Aunties so I think a few of Rachaels children moved in that directionally I rememberr an Aunty Sally and and Aunty Florrie who always made cakes……lol Things you remember as a kid.